EXO’s Chen reveals ‘April, and a Flower’ schedule! 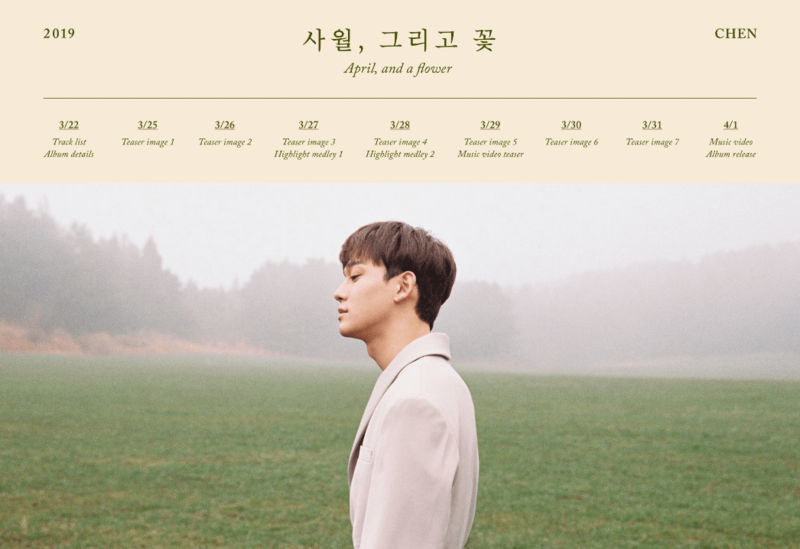 EXO’s Chen has unveiled the schedule to his upcoming mini solo album, ‘April, and a Flower’! In the image portion of the schedule, in an off-white blazer or coat, Chen looks to be walking deep in thought. He’s surrounded by a lifting fog, that allows us to make out silhouettes in the background. The shot seems like a close up of the painted image teaser that was revealed earlier this week. The schedule outlines the release dates of the album’s track list, image teasers, highlight medleys, music video and album release. Fans should expect album details and a track list on the 22nd of March, and then teaser images and highlight medleys, up until the release of the MV and album on the 1st of April. Are you excited for Chen to debut with his first mini solo album? Let us know in the comments below.